When properly cared for, pavers can add elegance to any home. However, when pavers are neglected, they can drag down the curb appeal and value of your entire property. One of the best ways to ensure lasting beauty and durability for your pavers is to invest in paver sealing. 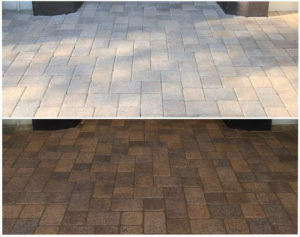 Beauty: Paver sealing will help preserve the natural color of your pavers. Color-enhancing products that can give your pavers a darker, more saturated color or “wet” look are also available. Durability: Paver sealing adds a layer of protection to your pavers that can help them resist abrasion, staining, and UV damage. Easier Maintenance: Because paver sealers sink into the pores of the pavers, making them smaller, your pavers will be less likely to trap dust and dirt and easier to keep clean. The first step in any paver sealing job is to thoroughly clean the pavers. This prevents trapping any stains or dirt beneath the sealant and also ensures a good bond. Our state of the art pressure washing equipment gives us the ability to tailor the water pressure and temperature to the specific needs of each job. Our skilled and experienced technicians will use enough heat and pressure to remove dirt and stains efficiently, but not so much that there is any risk of damage to your pavers. Once your pavers are clean and dry, we will carefully apply the appropriate paver sealing product. Whether you are looking to improve your pavers’ appearance, protect against staining, or help stabilize the joints, there are many different sealers to choose from to achieve your goals. After many years of experience, we know the best products and methods to use for paver sealing. Depending on the type of sealer you choose, it may need to be reapplied every few years to ensure continued protection. At The Pressure Washing Guys, client satisfaction is our top priority. We will work with you closely before, during, and after work to make sure we understand your expectations and deliver the results you want. We guarantee your satisfaction with our service 100 percent. If you are interested in learning more about how The Pressure Washing Guys can protect your property with paver sealing, call us at 949-514-7749 for a free estimate.